"On behalf of the Vision Working Group for the Council Initiative on Public Engagement, we want to thank you again for your time and input on the Vision and the Guiding Principles on Public Engagement for the City of Edmonton. As promised we have crafted a Summary Report which includes an overview of the methodology used for the testing, summaries of the data we received, and insight into how your input was used to inform the final product. If you have any feedback or questions regarding the process of testing for the Vision and Guiding Principles please do not hesitate to be in touch. 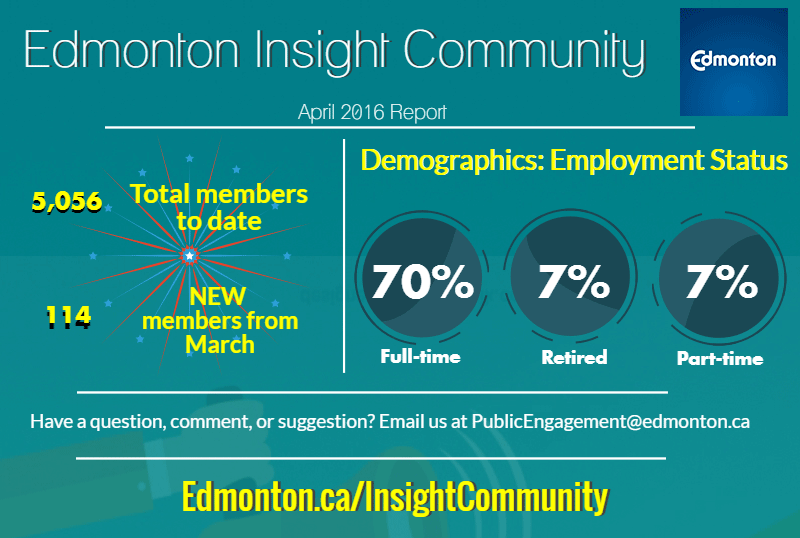 Thank you again for all your contributions to help improve how the City of Edmonton does public engagement." "The Imagine Jasper Avenue project team used the survey results to help confirm the vision and guiding principles for the project. The results are also being used to help the team understand Edmontonians' priorities when it comes to making Jasper Avenue Edmonton's premier Main Street. These priorities will impact the concept streetscape designs options the team is creating for the avenue." "Thank you for providing your input. Here are some quick results for your interest. - Nearly two thirds of respondents park where they do because "it is the most convenient" and "it feels the safest". - 66% park in their garage or assigned parking spot. - 56% of all respondents think minimum parking should be required for the needs of a typical day, or less. The next most chosen option was the busiest day of the week (18%). - 94% of all respondents somewhat support or strongly support allowing parking spaces to be shared. " In the April mixed topic survey, we asked if you agreed or disagreed with a number of statements regarding your Insight Community experience. Below are the results of 1,403 Insight Members. The Insight Community team will work harder to better demonstrate how your input is being used and makes a difference. We appreciate your on-going participation and insight!